Teaching meditation offers rewards that can only be measured by gratitude of those that experience profound transformative insight as as expressed shown above to their teacher and guide, David Johnson. From the age of 19, David began a longtime practice of vipassana using the Mahasi Sadaw method of mindfulness meditation. He practiced meditation intensively through the 1990's participating in retreats lead by Joseph Goldstein, Jack Kornfield, Venerable U Silananda and other prominent meditation teachers. Since 2006, David changed techniques and exclusively practiced tranquil wisdom insight meditation, TWIM, attending dozens of residential retreat lead by Bhante Vimalaramsi. After assisting Bhante in guiding hundreds of meditators with individualized instruction, David was asked to teach and expand the online retreat program Dhamma Sukkha. David's scholarship in early Buddhist texts and meditative practices accords him a broad foundation to teach introductory and accelerated meditation training to beginners or experienced meditators seeking to experience greater awakening. 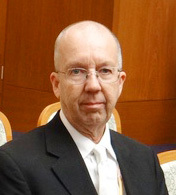 He was ordained temporary as a samenera by Bhante Vimalaramsi, David is currently the executive assistant for Bhante Vimalaramsi and general manager of Dhamma Sukkha Meditation Center and treasurer of the United International Buddha Dhamma Society. ​David's dedication to practicing the teaching of the Buddha took him to the Stillpoint Institute, a San Jose based vipassana meditation center where managed financial and administrative affairs. In 2010, he retired as a production and logistics manager for Silicon valley technology companies and joined Bhante Vimalaramsi at the Dhamma Sukkha Meditation Center to expand residential facilities and expand the retreat programs to more participants. Online retreats are designed to introduce people to a simple meditation practice known as Tranquil Wisdom Insight Meditation, TWIM. The foundation for this meditation is found in the earliest Buddhist texts. This goal is to lean how to let go of the causes of unhappiness and suffering and enjoy life and the potential for contentment. These retreats are designed so that the meditation practice and study program is integrated into everyday life. Participants are mentored and guided on a daily basis but continue working and live normally while cultivating meditative skills and knowledge that results in wisdom and well being. ​Hundreds have discovered that this program answers the question; why meditation is a essential skill that can be an integral part of life. They also learn through observation how to train to unhook from compulsive emotional reactions and how be responsive and more thoughtful. Meditation is known to relieve stress, lighten life’s load while bringing with it relief mentally and physically. Beginners will find this program rich in content and results oriented.